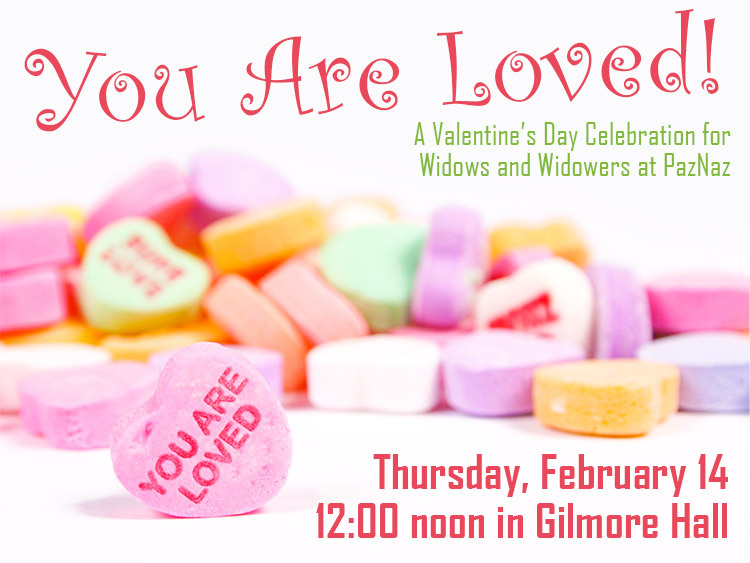 It’s time to RSVP for PazNaz’s Valentine’s Day Celebration for widows and widowers on Thursday, February 14, at 12:00 noon in Gilmore Hall. This year’s theme is You Are Loved! and will feature entertainment and a free lunch. Please contact Melody Bundy at mbundy@paznaz.org or 626.351.2425 to make your reservation by Wednesday, February 6. Your help is needed! If you would like to be a blessing this Valentine’s Day and are able to serve at this year’s luncheon on Thursday, February 14, from 11:00 am-2:00 pm, please contact Melody Bundy at mbundy@paznaz.org or 626.351.2425.